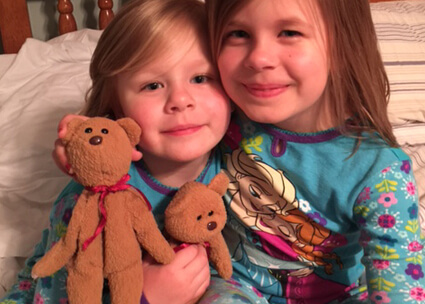 Our You and Me Bears are a way for children spending time in the hospital, to stay connected with a sibling or loved one during times they have to be apart. 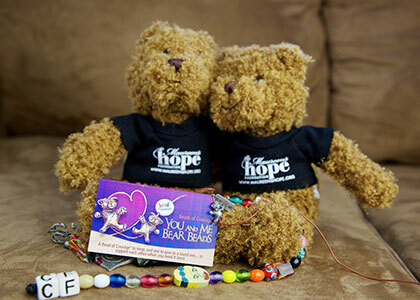 The You and Me Bears project is named after a song by the Dave Matthews Band. It is through the generous support of their foundation Bama Works, that we can be reminded that we are all connected. A reminder to children that you are not alone. 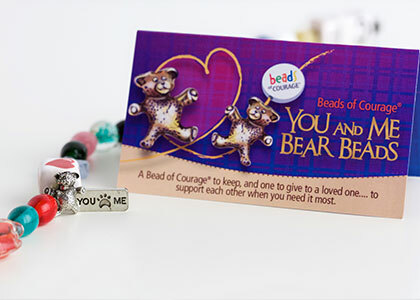 Included with the Bears are two special You and Me Bear Beads. One to keep and one to give; symbolizing connection. This bead can be added to a child’s Beads of Courage, Sibling Beads of Courage or worn when they are in need a little extra support or are thinking about each other. 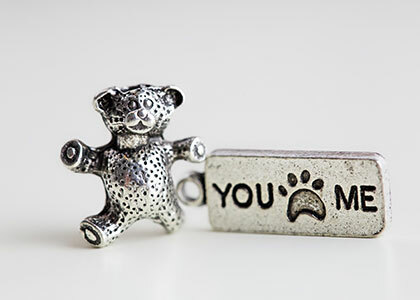 Our You and Me Bears & Beads are a gentle reminder that we are always connected. 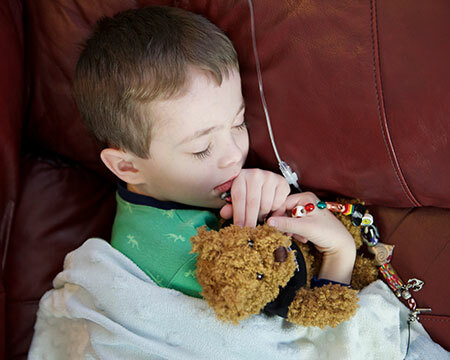 Pictured is cancer survivor,William Relyea, with his You and Me Bear. 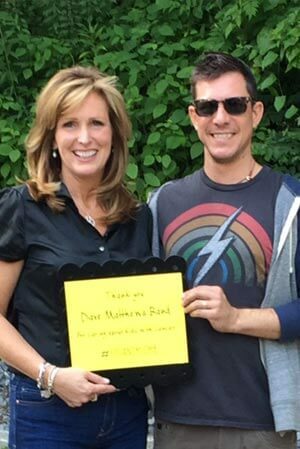 Pictured is Susan Bertrand with Stefan Lessard, bassist for DMB, holding William’s sign. For five years I had the belief that one day Dave Matthews would learn about how his music helped inspire a vision of hope. In May of 2015 the time felt right, and we began a social media campaign to connect with the band. With thanks to an army of support, through Twitter and Facebook, within 10 days, we connected with Stefan Lessard, bassist for the band. Stefan is an original band member and reached out to me through an email telling me how much he loved the program and asking how he could help. 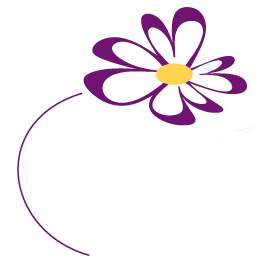 Through some conversations, he connected us with their charity and they committed to funding the You and Me Bear program for Maureen’s Hope at Golisano Children’s Hospital for the next two years and to discuss further how we might expand the program to other hospitals. Most exciting is that a relationship has been established between Maureen’s Hope and their national charity, Bamaworks, and it’s one we both plan to continue. The story gets even better. The Dave Matthews Band played to a sold out crowd at the Saratoga Performing Arts Center on June 3 & 4 and Stefan invited us to meet with him before the concert. On our drive to Saratoga, I was reminding myself to focus on “listening” when I met Stefan instead of “talking”. I had already given him the background on the foundation and he was on board. Now, I wanted to learn about him and why he was passionate about our cause. He shared some stories with us and I learned what a genuine, authentic and compassionate man he is. So real. The evening was very much a full circle moment for me personally and for Maureen’s Hope. When my sister Maureen was in the hospital battling cancer, my brother Garry had purchased tickets for her to see the Dave Matthews Band in concert. While Maureen never did make it to the concert, I remember those tickets represented belief in the future and better days ahead. She knew we had HOPE. Now, here we were 14 years later, on behalf of Maureen’s Hope Foundation, meeting with the Dave Matthews Band. Heartwarming and simply incredible. Follow your feelings, believe with your heart and you can successfully manifest your dreams. 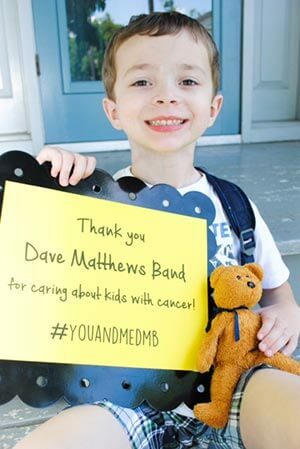 If you, your company or someone you know might like to partner with Maureen’s Hope and the Dave Matthews Band to bring the You and Me Bear program to other hospitals and make the journey a little easier for pediatric oncology and cystic fibrosis patients, contact us today! Read more about our appeal to the Dave Matthews Band in an article published by Syracuse.com on May 14, 2015.